Giving your website visitors suggestions about what they can read next on your website could be a good idea in increasing your website’s likeability. This would help in terms of increasing the time spent on your website, it will decrease the bounce rate (the % of visitors exiting your page after first visit) and overall it can help in increasing the likelihood of returning visits in the future if you have vast content for your web audience. If you are using Blogger, Wordpress, Typepad or any other hosting method for to host your website or blog, it is quite simple. 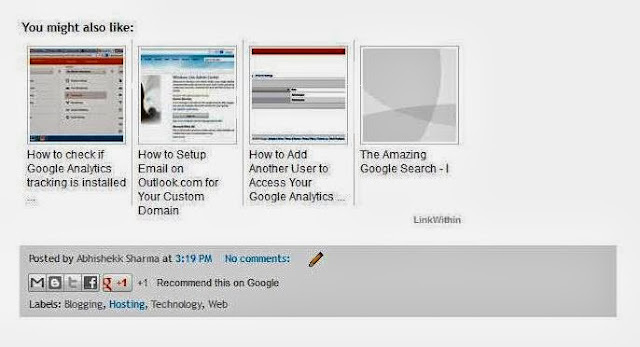 You can use this widget which is called LinkWithin (Click here: http://www.linkwithin.com/learn?ref=widget ). The setup is pretty fast and neat! You simply go to the link fill your email address, blog link, platform (Blogger, Wordpress, Typepad or any other), choose no. of posts you want to suggest for visitors (3, 4 or 5) and simply click on Get Widget- the self guiding install guide will setup this widget for your website in minutes. Once you have successfully installed it, it will start showing a list of related posts your visitors might be interested at the end of the post. This is a free service and works like charm in helping visitors navigate on your website effectively.